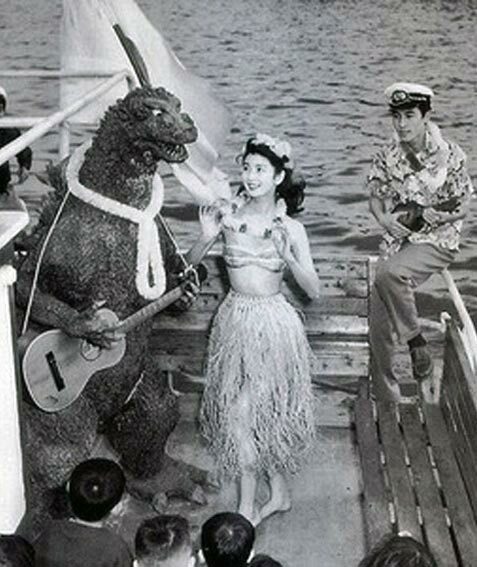 I’d hoped to write a longer Godzilla blog entry before my trip to the coast, but ran out of time. Instead, enjoy this WILL-AM radio program from 2004, in which I interviewed William Tsutsui, author of Godzilla on My Mind. Once again it’s that time of year when WILL-AM’s regular radio hosts go on vacation and I have the opportunity to take over the microphone for an hour. 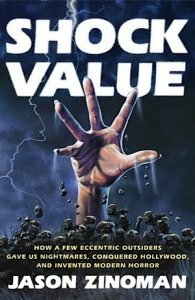 Tomorrow (Friday, September 16) at 11:05 am Central Time, I’ll be interviewing Jason Zinoman, author of the film history Shock Value. The book recounts how horror movies, once epitomized by Gothic castles and Vincent Price, gave way to zombies, stalkers and cannibals in a disorienting mix of the fantastic and the mundane. The late ’60s and early ’70s gave us George Romero, John Carpenter, Wes Craven and Tobe Hooper, who collectively took fright features out of the realm of kids’ stuff. If you’re not in WILL-AM’s Central Illinois coverage area, you can listen online. If you miss the live broadcast, it’ll be in our archive. And we’ll be taking listener questions; call in during the show at 800-222-9455. I felt that yesterday’s interview with Andrew Keen went well. I only lost my train of thought once. I thought Keen was a good guest, though some (including my darling Vicky) felt he was arrogant. What surprised me was that he had already anticipated some of the Devil’s Advocate points I’d intended to raise; presumably he’d been previously taken to task over his seeming trust in the mainstream media. He did at one point get into a heated exchange with a caller, and one listener to the broadcast felt that I shouldn’t have allowed him to get away with interrupting the other party. For my part, I felt that the caller was spoiling for a fight from the start, and was interrupting as often as he himself was interrupted. I didn’t see an opportunity to interject myself into the dialogue without shouting down the two of them and adding to the problem. Beisdes, I’d prefer to err on the side of allowing both guest and caller the opportunity to be themselves, warts and all, before bringing down the heavy hand. The alternative is to drop the caller, something we eventually did in this case. If you missed the show, it’s available in the WILL archive. Bumped to the top of the page to serve as a reminder. My radio interview with Andrew Keen, author of The Cult of the Amateur: How Today’s Internet is Killing Our Culture, is scheduled for Tuesday, September 18 at 11:06 am Central Time. It’ll be streamed live on the WILL website. And if you want to call in during the show–which, if nothing else, keeps me from having to do all the talking–the phone number is 333-9455. Outside the Champaign area, you can use our toll-free line: 800-222-9455. It should be a lively show. Certainly, just telling people about the topic has provoked some strong reactions amongst those I know. At last, my dad is supposed to be going home today. He’d been in the rehab wing of a nursing home for the past several weeks building up his strength. I talked to him last night, and he was sounding good. I’m going to go up and stay with him this weekend. Recently I’ve been doing the chiropractic thing. I had my initial intake a few weeks back at a clinic that told me I needed to come in for fifty visits over a six-month period at an after-insurance cost of more than two thousand bucks. And then they wheeled in the financial counselor to discuss payment options. After they woke me up from the fainting spell, I got the hell out of there and got me a second opinion. The new guy–who I’ve been seeing since last week–is instilling me with much more confidence. He hasn’t used any pseudo-science terminology or suggested any miracle cures. He told me that he’d have me come in a few times over a two-week period and see how it goes, which is a far, far cry from Mr. Big Shot Wellness Doc and his extended payment plan. He’s been smacking me with some little pneumatic hammer device that’s supposed to apply so many pounds of pressure in a quick burst in a specific spot. It feels a little silly, but it does seem to be doing some good: I’m not listing to the left side like I have been for the past year or so. On the work front, it looks like I may be on the radio again sometime next week. It’s been nearly three years since my last guest host stint on WILL-AM. We’re trying to line up an interview with Andrew Keen, author of The Cult of the Amateur: How Today’s Internet is Killing Our Culture. I don’t agree with all of Keen’s conclusions, but it’s a provocative book which suggests that the movements toward citizen journalism and do-it-yourself media such as Wikipedia and YouTube are dismantling professional institutions and putting experienced news gatherers out of work, replacing them with misinformed blogs and amateurish (in every sense of the word) talent shows. To be sure, there are plenty of warning signs that traditional media are withering, and for reasons both personal and professional I agree that this is not a good thing. Some of the backlash against the mainstream media may be deserved–they certainly allowed themselves to be cowed by their political opponents in recent years–but bloggers are in no position to replace them. Blogs still largely depend upon the wire services and major dailies for their info, and lack the resources to do their own news gathering or to place correspondents in foreign trouble spots. Mostly, what they offer is opinion: lots and lots of non-fact-checked, semi-rational, ethically-unfettered opinion. I’ll post a date and time when we’ve confirmed our guest. This morning I was on the radio again, filling in as guest host for WILL-AM’s interview show, Focus 580. This was the first time I’d hosted a full hour on a subject I hadn’t personally selected. The guests were Sam and Joan McCready, writer/actors who were in town to present a one-woman play about Lady Gregory, one of the founders of Ireland’s Abbey Theatre. While I have a theatre background–including a minor from Ball State University–this is serious Theatre, something I’ve largely attempted to avoid. Plus, the book of Lady Gregory’s memoirs which our producer had helpfully provided had threatened to put me to sleep the moment I cracked the spine. I admit I was very concerned that I’d run out of questions. Thankfully, the two were pretty chatty, so I had (barely) enough material to get through the hour, even though the only listener to call in a question wanted to know the names of the guests. And I didn’t fall asleep–bonus! It turned out surprisingly well, and it’s available on the WILL web site if anyone cares. I’ve just been scheduled to do another show on Monday, November 29 at 1:00 pm CST with Gerard Jones, author of the book “Men of Tomorrow: Geeks, Gangsters and the Birth of the Comic Book.” Should be fun! You can listen to it live.